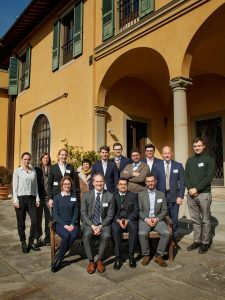 The 2018 workshop by the Club of Florence network was conducted on February 26, 2018 at Villa Schifanoia of the European University Institute (EUI), Florence School of Regulation (FSR). 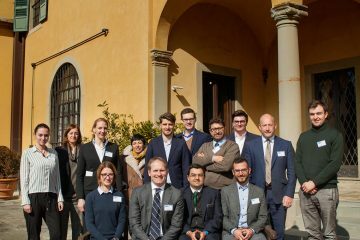 Altogether 15 experts took part from different renowned universities and business practice partners. 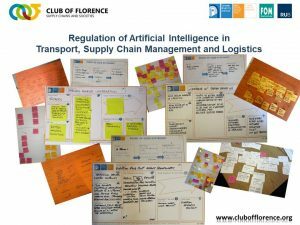 The topic was “artificial intelligence regulation in transport, supply chain management and logistics” and ignited many interesting discussions, ideas and innovations. 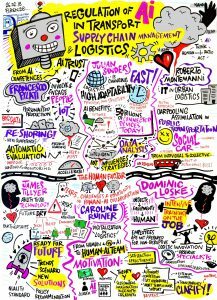 Six input presentations in two sessions were provided as caught by the graphic recording depicted below. 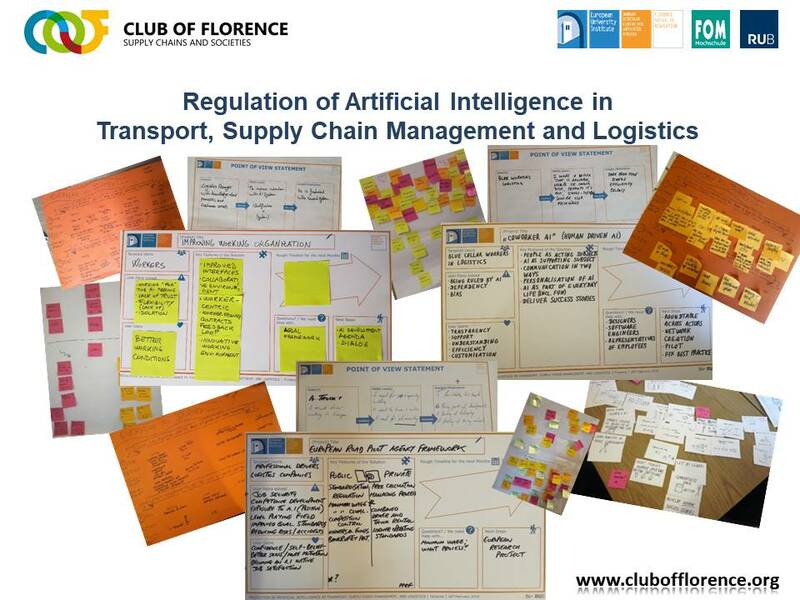 The application of artificial intelligence (AI) and robotics in transportation and logistics will be a major innovation, growth and efficiency driver in the next 5-15 years, for many areas even a “game-changer” (e.g. automated car pooling systems revolutionizing urban mobility). The application of AI in business contexts seems to be a two edged sword promoting opportunities while involving risks and challenges. The human-AI collaboration decisively depends on its design requiring opportunities for autonomous decisions, feedback and participation as well as individualized and respectful communication of support and care. For acceptance and human-AI-team building as well as a proactive use of AI, digital devices and robots are to be designed to support humans, not to control or direct them. 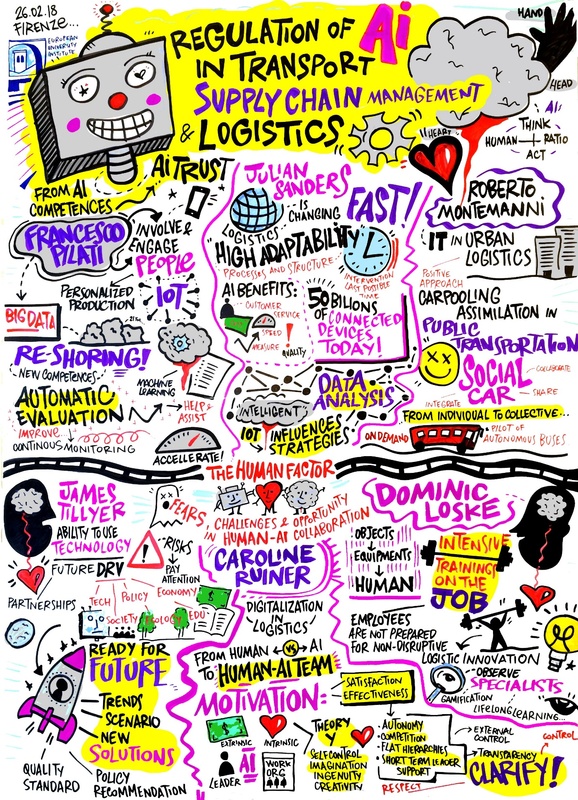 The preparation and participation of the human workforce in combination with such applications as human-computer interaction (HCI) is an important issue for individuals regarding the acceptance and the use of AI, for unions, politics and regulation as well as businesses in order to retain competitiveness and design positive impacts. Regulation issues require local, regional, national and European actors to step in addressing standardization, safety and trust issues for the general public (automated driving) as well as the European workforce in transportation and logistics. 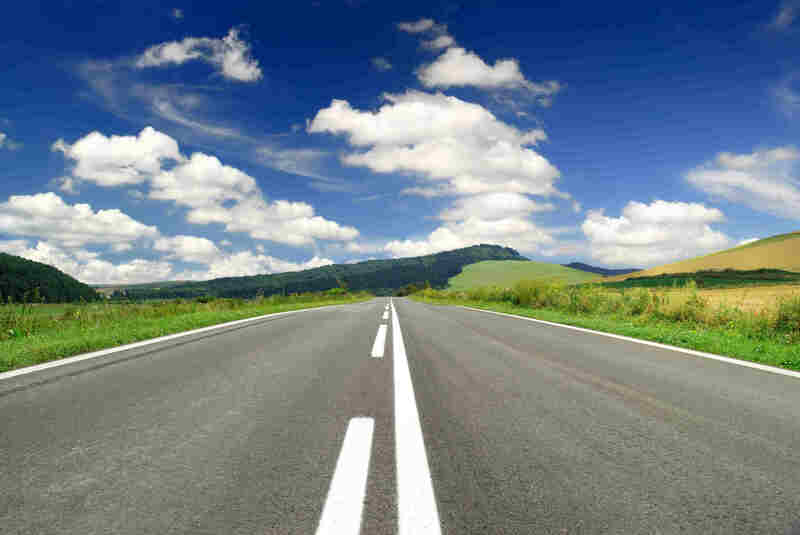 All societal groups and representatives are called onto this major task as the world of work as well as general mobility will change significantly and will require structured guidance. The topics warrants further investigation and requires sufficient attention and support in order to explore detailed and sensible framework as well as operational solutions to process, collaboration and regulation questions. The ideas generated and approaches developed will be continued further in different dialogue and research contexts (research proposals, publications etc. ).